Don't forget to enter the Whirley Pop giveaway. It ends tomorrow! Am I the only person that asks their friends what they're making for dinner all the time? That's kind of why I started this blog, because I want to know what my friends are making for dinner. The other day I asked my friend, Juli (who is great cook), what she was making for dinner. She told me she was making Chicken Angelo. Then she told me what's in it. I knew I had to try it too because she has some picky eaters at her house like I do. I figured if they'll eat it then maybe it was worth a try at my house. 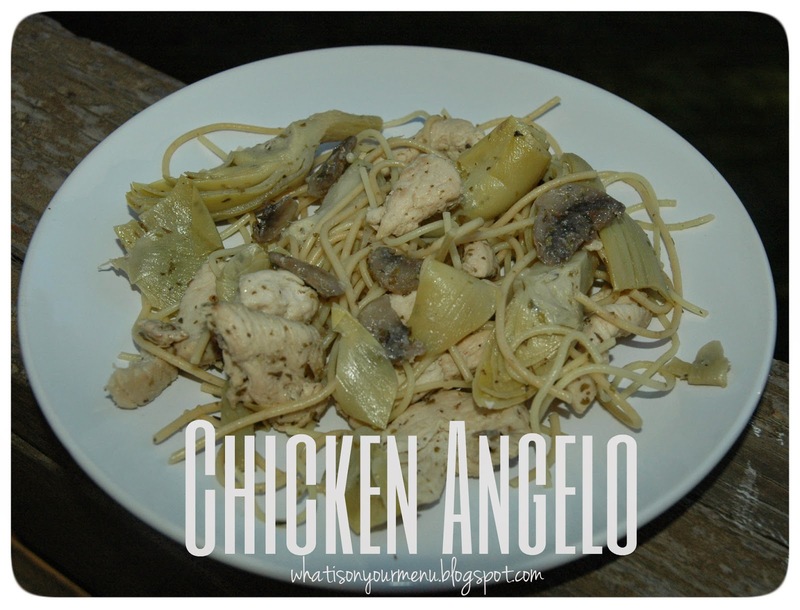 This Chicken Angelo pasta has my favorite things, artichoke hearts and mushrooms in it. But don't be fooled into thinking that my family likes these things too. Because they don't. They won't touch an artichoke or mushroom with a ten foot pole. That being said, my family loved this pasta dish. They even gave me the go ahead to make it again. They loved the chicken and noodles. And I got to eat all the mushrooms and artichokes, which was okay with me. Don't leave the artichokes and mushrooms out. They add yummy flavor to the sauce. You just don't have to make the haters at your house eat them. These noodles actual taste yummier as leftovers, so this is a great make ahead dish. Make it in the morning and let the flavors intensify in the fridge until you warm it back up at dinnertime. Brown chicken pieces in a little olive oil at medium high heat with fresh minced garlic. Once brown, reduce heat until cooked through. Add Italian seasoning, mushrooms with liquid, vinegar and artichoke hearts (with liquid). Cook over low heat about 15 to 20 minutes or until sauce reduces a bit. Cook pasta according to package directions, drain and add to chicken/sauce mixture. Toss until well coated and serve.